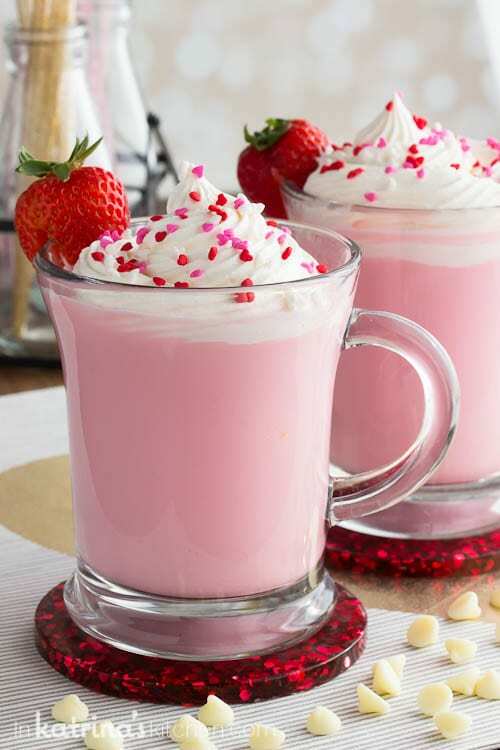 Pink and pretty, this Strawberry White Hot Chocolate uses prepared strawberry milk for a sweet hot chocolate mix-up. Top with homemade whipped cream made in under 1 minute! This post is sponsored by The American Dairy Association Mideast All opinions are my own. I kind of have a thing for sipping all different kinds of hot chocolate. At Christmastime my husband requests Eggnog Hot Chocolate. My kids always love having Hot Chocolate on a Stick handy. 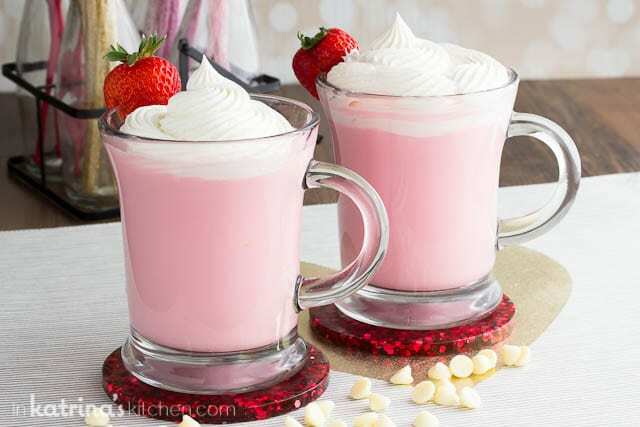 So I thought it was time to share my favorite- Strawberry White Hot Chocolate topped with fluffy layers of quick and easy Homemade Whipped Cream. I began working with the American Dairy Association when my oldest was in first grade. Until that time I had been insistent of my son choosing white milk only. But then I learned that Flavored milk contributes only 4% of the added sugars to children’s diets ages 2-18, while soft drinks and non-carbonated sweetened beverages contribute about 46% of the added sugars. I would much rather my son choose flavored milk than soda and some other packed lunch choices. Now I let my children choose milk—white, chocolate or strawberry! It’s all delicious and nutritious. Making whipped cream is so easy. I hope you try it at home. I’ve included a quick video tutorial. You can find the recipe and notes included below. The powdered sugar in this recipe helps to stabilize the whipped cream so that it can be prepared and stored in the refrigerator for up to 24 hours. Treat yourself this Valentine’s Day! 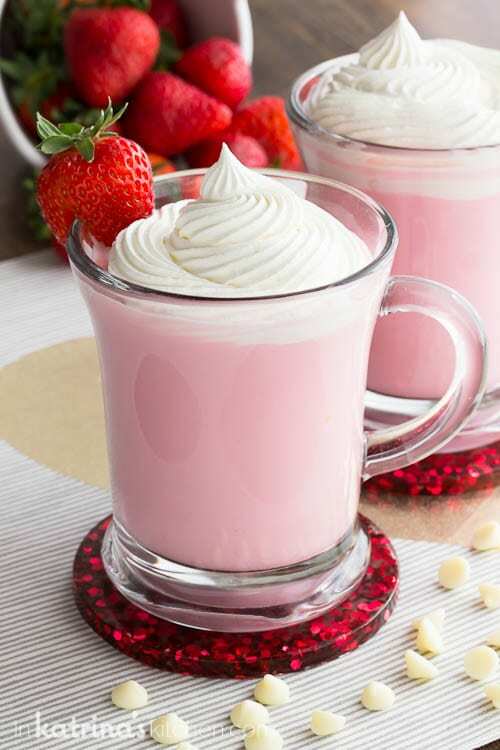 Pink and pretty this Strawberry White Hot Chocolate uses prepared strawberry milk for a sweet hot chocolate mix-up. Top with homemade whipped cream made in under 1 minute! 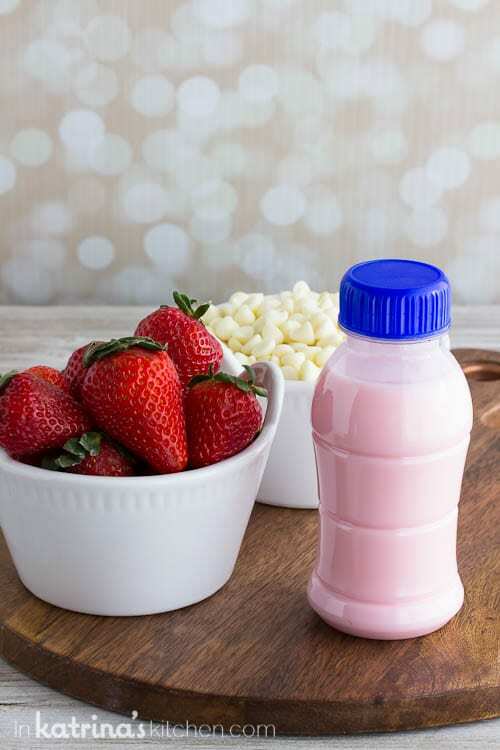 In a medium sized pot stir together strawberry milk, vanilla, and white chocolate chips. Over medium heat cook, stirring occasionally until the white chocolate melts and the drink comes to a simmer. (Do not let it come to a boil.) Continue to stir to ensure all of the white chocolate has melted. Remove from heat and serve immediately. Top with fresh whipped cream or frothed milk. Beat cream for 30 seconds until it starts to thicken. If using an immersion blender use a slow up and down motion. Add powdered sugar and vanilla. Mix for 30-45 seconds more until soft peaks form. Use to top your favorite hot drink or dessert! Place beater blades or immersion blender shaft in the freezer for 10 to 15 minutes on hot summer days (blender shaft only if it detaches...no electronics in the freezer!). This helps the cream to whip faster. If making a large batch of whipped cream in my stand mixer I usually place the mixing bowl in the freezer as well. Not sure what size bowl to use or how much cream? Remember that in general cream doubles in volume when whipped. If you are using an immersion blender in general you would choose a tall cylinder (many blenders come with a tall cup). Whip just until soft peaks form. A soft peak should form in the cream, dropping to one side, not hold its shape entirely. Don't over whip (you want to avoid making butter!). You can use any flavor extract including clear vanilla, rum, amaretto, almond, and more. You can also omit the flavor if desired. Whipped cream can be prepared and stored in the refrigerator for up to 24 hours. 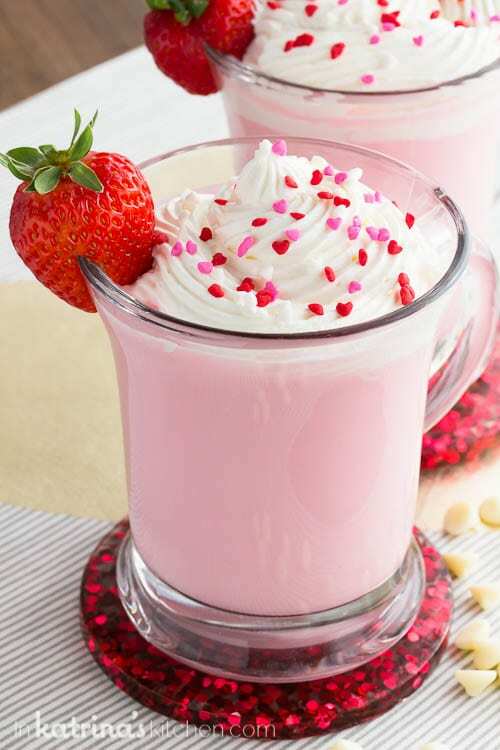 For more Valentine’s Day recipes, information dairy nutrition and to meet Ohio and West Virginia dairy farmers, visit Drink-MIlk.com, and follow the American Dairy Association Mideast on Facebook, Twitter, Pinterest and Instagram. Share why you love dairy this February using #DairyLove! I’m happy to partner with the American Dairy Association Mideast to bring you dairy-filled treats all year long. As always, opinions expressed are my own. Thank you for supporting the brands that I work with, and for stopping back to let me know how your family loved my recipes as much as our family does!